Campus Ås will get 227 new units of student housing in the summer of 2014. With this increase in housing capacity, UMB and the University Foundation for Student Life in Ås can offer accommodation for more students and most likely also for more guest researchers. 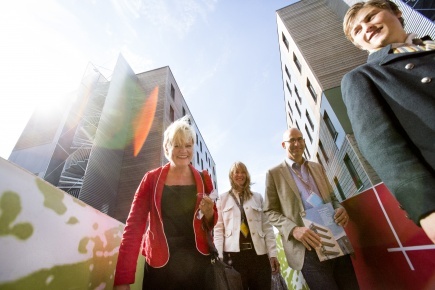 In August 2013, Minister of Education and Research Kristin Halvorsen opened 254 new, environmentally friendly student housing units at Campus Ås. Minister of Education and Research Kristin Halvorsen opens the new environmentally friendly student housing built in massive wood. Here she is shown with SiÅs Chair Torfinn Belbo (from the left), UMB Rector Hans Fredrik Hoen and Pro-Rector for Education Mari Sundli Tveit. Pål Magnus Løken of the University Foundation for Student Life in Ås (SiÅs) reports that the next stage of the building process is already underway. In addition to the 254 new student housing units that opened this August, 227 units will be completed by the summer of 2014. 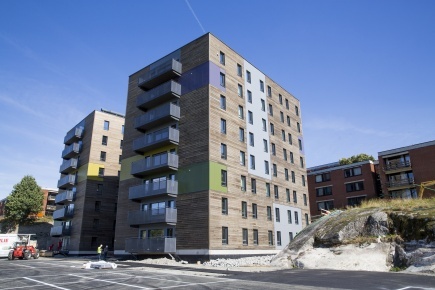 SiÅs will then be able to offer new studios and flats for couples, as well as shared accommodation. The housing units are an expansion of the Pentagon student village. The new housing area has been named Palisaden. "The housing situation is much better than before", Løken says. "We have 300 more rooms this autumn, and we have been allocating housing on an ongoing basis to avoid a housing queue", he notes. When the next building stage has been completed, housing coverage will be so good that accommodation will likely be available for several guest researchers. The new accommodation consists of "passive" houses. This means that they are built using a special construction that requires much less energy than traditional buildings. They are also fitted with climate-friendly geothermal heating systems. Houses in massive wood contribute to lowering CO2 emissions because they contain a lot of wood, and wood binds CO2. The new and environmentally friendly student housing at UMB.